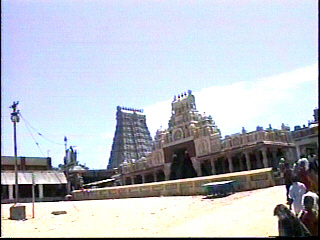 Tiruchendur is one of the six Aarupadai veedu shrines of Murugan, enshrining Senthilandavar. It has been venerated by the Tamil Sangam Period work Tirumurugatruppadai and by 83 Tiruppugazh hymns of Arunagirinathar. It is one of the most visited shrines in Tamilnadu, and is located on the seashore in the southern part of the state near Tirunelveli and Kanyakumari. Situated on the route between Tirunelveli and Tiruchendur are 9 of the 108 Divya Desam Temples of Vishnu, collectively known as Aalwar Nava Tiruppatikal, the first of which is Sree Vaikuntham and the 9th, Aalwar Tirunagari. There are several literary works singing the glory of Tiruchendur. The Sangam works Puranaanooru and Akanaanooru speak of Tiruchendur as Senthil and Alaivaai respectively. Illango Adigal refers to Tiruchendur, Tiruchengode and Swamimalai as abodes of Skanda in his work Silappadikaaram. While the other five padaiveedu shrines are situated on hills or mounds, this is situated on the seashore, bounded on the north and the east by the sea. Legend has it that Skanda vanquished the demon Soorapadman and his army, in his fortress Veeramahendram situated in the middle of the ocean here. History: Several accounts of the temple's history are gleaned from various sources. The Dutch (in the 17th century) are said to have stolen the image of Skanda and are said to have thrown it into the sea upon discovering that it was not made of gold as they had thought earlier. A worried local chieftain had a substitute image made; however just prior to the installation of this image, he was directed by a dream to a spot on the ocean where he discovered the original mandapam. He is said to have built the Pillaiyaan mandapam commemorating this discovery. It is also believed that this original image was recovered from a capsized Dutch vessel in the 17th century at the confluence of the Kaveri with the ocean in the historic Chola capital Kavirippoompattinam or Poompuhaar. This image with a shiny golden appearance is enshrined in the Pallavaneeswaram temple at Poompuhaar. A similar image of Senthil Aandaver is also enshrined at Tiruchaaikkadu near Pallavaneeswaram. Both these images are believed to have been discovered on the seashore, and both depict Skanda in a warriorlike posture. Although the shrine is of ancient origin, much of the structure here is from the 19th through the 20th centuries. Inscriptions from the 9th century Pandya rulers are seen in the temple. It is believed that this shrine was originally rock cut structure, cut out of a local hill, and later renovated with granite. The temple is an imposing structure with a nine tiered gopuram (137 feet in heicht)adorning its entrance, visible for miles around. In front of the temple is the Shanmukha Vilaasa mandapam with several carved pillars. The main entrance to the temple faces south although the sanctum faces the east. The temple has two prakarams. The sanctum to Subramanyar (moolavar) is located within the innermost mandapam. Adjacent to the sanctum is the Panchalingam shrine in a cave like structure, where it is believed that Subramanyar worships Shiva. Adjacent to Subramanyar's sanctum is the Senthilaandavar sanctum housing the processional images of Subramanyar with his consorts. Also in the innermost prakaram facing south is the Aarumugaswamy shrine facing south. Also in the inner prakaram are images of the 63 nayanmars, and shrines to Natarajar, Karaikkal Ammaiyaarand others. Outside of the enclosure described above, in the inner prakaram are shrines to Valli and Devasena also facing east. The outermost prakaram is lined with pillared corridors, and it houses shrines to Dakshinamurthi, Mukkunni Vinayakar and Arunagirinathar. On the northern side of the outermost prakaram is a shrine to Venkatachalapati (also known as Nellai Govindan), along with sub shrines to Gajalakshmi, Pallikonda Ranganathar with his consorts. The Skanda Pushkarini or the Naazhi Kinaru is a step well is believed to have sprung up when Skanda's spear pierced the ground. It has an outer and a smaller inner well. The water in the outer well is brackish while the water in the inner one is fresh and clear. Kumara Tantram is the worship protocol observed here, in a manner similar to Keralite temples. Eight worship services are offered each day to Subramanyar. Special worship services are offered to Shanmukhar on the Vishakam asterism each month, and on Chittirai Vishu and Aippasi Vishu. The last friday of each month witnesses a procession of Senthilandavar and his consorts in the outer prakaram, whils processions within the inner sanctum in a manner similar to the Sri Bali ceremony in Kerala are carried out on a daily basis, in addition to special processions on Kartikai, Vishakam asterisms and the Sashti phase of the moon. There are 2 annual Bhrammotsavams here celebrated for 12 days each in the months of Maasi and Aavani. On the seventh and eighth days of both of these festivals, Shanmukhar is housed in the Shanmukha Vilaasa mandapam before and after the processions. The chariot festival happens on the 10th day and the float festival on the 11th. Also celebrated here is the annual Skanda Sashti festival in the tamil month of Aippasi where Soora Samhaaram is enacted in all its splendour on the seashore, following which Skanda's marriage with Devasena is enacted.. The Vishaakam festival is celebrated for 12 days in the month of Vaikaasi.